China’s first solar highway has been opened for public use, in what could mark a major shift in road manufacturing and solar power generation in the country. Located over a 2 km stretch in the eastern province of Shandong, the photovoltaic expressway is capable of converting sunlight into electricity and transfer it directly to the power grid. 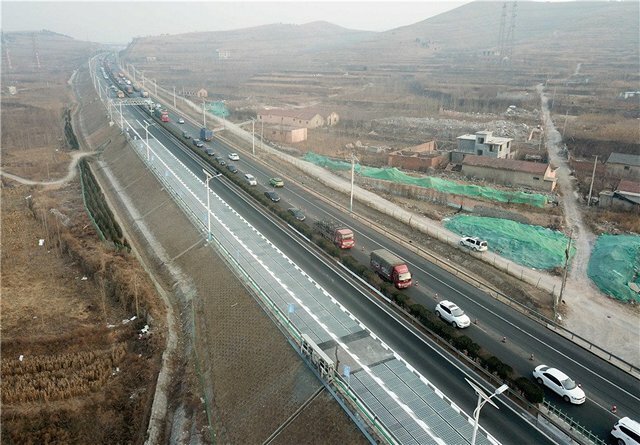 According to the Xinhua news agency, only a kilometre-long ‘test section’ has been opened to traffic, but once fully operational, it can reportedly generate 10 million kWh of electricity per year, as well as melt ice and snow in winter to improve road safety. If all goes according to plan, the road is expected to generate enough electricity to power everything from street lights to signboards to toll booths. Not only that, reports also suggest that the highway will eventually be able to charge electric vehicles that travel over it. The road has a targeted lifespan of 20 years and consists of three different layers. A transparent concrete top allows sunlight to penetrate down to the thin amorphous silicon panels in the middle, a waterproof insulating layer at the bottom makes sure the surface remains functional for its lifetime. According to Zhang Hongchao, chief scientist with a company called Shandong Pavenergy that was involved in the development of the project, “The top layer has good flexibility which can both withstand the pressure of large vehicles and protect the fragile amorphous silicon boards underneath”. The chairman of Qilu Transportation Development Group, also had high praise for the futuristic technology, saying that the photovoltaic road will “save the space for building solar farms and shorten the transmission distance”. While the cost of such projects is often a deterrent to their implementation on a larger scale, he said that this particular project only cost half of what similar projects in Europe are known to have cost. According to him, the cost can be further reduced with the continuing development of solar power in China.